Do you know what Qone8.com is? If you wish to operate your Internet browsers securely, you need to stay away from Qone8.com. 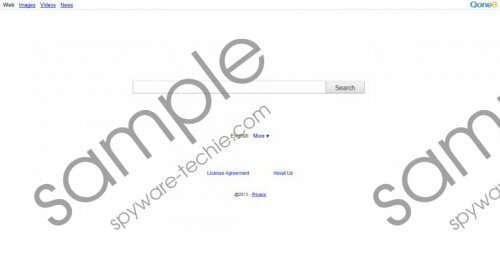 Even though this search engine may produce authentic search results, it appears that schemers have utilized it for highly malicious and illegal activities. You should be most careful if you have discovered this suspicious website set as your browser home page or search engine. It seems that the so-called browser hijacker can affect Internet Explorer, Mozilla Firefox, Google Chrome and other popular and widely used browsers. Once this happens, all you need to worry about is Qone8.com removal. Note that you may also face Qvo6.com or PortaldoSites.com, both of which act in the same manner as the browser hijacker. these [third party] links may lead to sites or links that contain offensive and objectionable content or which may contain dangerous computer viruses. You assume, and we hereby disclaim, all responsibility for any of the content on these sites or for any damage sustained by users of these sites. Needless to say, if you wish to browse without facing serious virtual security risks, you should employ a more reliable search engine. To remove the unreliable application it is recommended that you install authentic security software which could delete Qone8.com hijacker automatically. The manual removal of the threat certainly is not easy; however, if you wish to change your browser settings – the manual way is the only way. Follow the guide below to remove the unwanted home page or search engine. Change/remove the URL under Home Page. Now click the icon placed on the search box and select Manage search engines. Remove the unwanted provider and click OK.
Move to Search and click the drop-down menu underneath. Select the preferred search provider. Click Manage search engines, move to the unwanted provider and click X to remove it. Open IE, simultaneously tap Alt+T and select Options. Click the General tab, overwrite the Home Page and select OK.
Click Search Providers and Remove the unwanted choice. Click Close. The removal of Qone8.com browser hijacker may determine the security of your entire operating Windows system, which is why it is recommended that you delete it from the computer instantaneously. Install a reliable malware remover and follow the manual guides to get rid of the threat. Tags: delete Qone8.com, Qone8.com, Qone8.com removal, remove Qone8.com.